A look at the world of rock & heavy metal with insight on some of the best-ever bands and albums. Look for stories about Metallica, Rolling Stones, Black Sabbath, Iron Maiden, Alice in Chains, Guns N Roses, Fleetwood Mac and more. 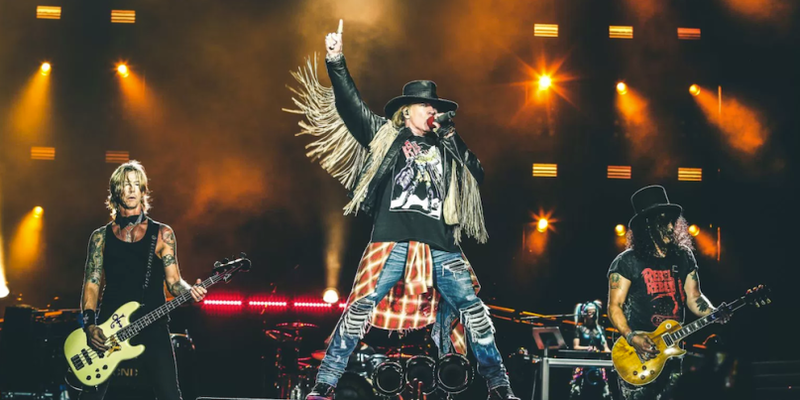 After wrapping up their "Not in This Lifetime" tour in December, 2018, it looks like the touring Guns N' Roses lineup is going to record a new album. That means three-fifths of the original band will be at it again with vocalist Axl Rose, guitarist Slash, and Duff McKagan on bass. Additional members would include guitarist Richard Fortus and (hopefully) drummer Frank Ferrer. Slash currently has touring commitments with Myles Kennedy through August, so presumably the top-hatted one would be working with Rose and the rest of the band after that. 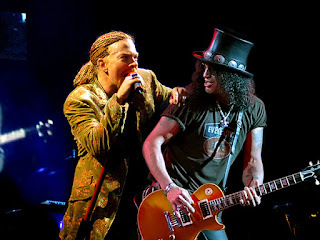 "Slash is on tour right now. Once he gets back from that, we’re gonna get some more recording done and hopefully get an album out soon. And then we’ll get back to touring," Fortus told the St. Louis Dispatch. He went on to say a new record could come around "faster than you think." The most recent Guns N' Roses album, Chinese Democracy, which was some 11 years in the works, features only Rose as an original band member. While it would be great for the Gunners to make a record with the original lineup, including drummer Steven Adler and guitarist Izzy Stradlin, chances are it won't happen. And if the band is indeed working on a new album, knowing Rose's perfectionist OCD tendencies, it likely won't be released in 2019. Given Rose wrote at least two albums worth of material during the Chinese Democracy period, one wonders how many of those tracks will see the light of day on a new record and get some input from Slash and McKagan. Can Slash and Axl Rose Get Along? Also too, it remains to be seen if Slash and Rose can work together in the studio. Remember those ugliest feuds. In his 2007 biography, Slash stated he left Guns N' Roses because of Rose's constant lateness to concerts, the alleged legal manipulation Rose used (since denied by Rose) to gain control of the band, and the departures of original drummer Steven Adler and guitarist Izzy Stradlin. For his part, Rose stoked the fire with some nasty words in a 2009 interview, saying "Personally I consider Slash a cancer and better removed, avoided — and the less anyone heard of him or his supporters, the better." No doubt Rose knew Slash had lost his mother to cancer and the comments didn't sit well with the guitarist. Rose also told Billboard in 2009 (when there was talk of a GNR reunion back then): "What's clear is that one of the two of us will die before a reunion and however sad, ugly or unfortunate anyone views it, it is how it is." Well they got together for the reunion tour (money has that type of influence), so fans are hoping they can get through making another album together.